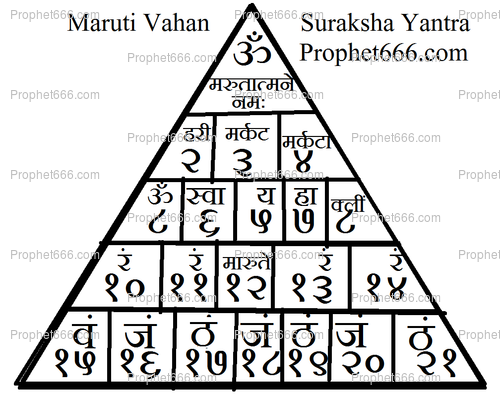 This is the most famous Maruti Vahan Suraksha Yantra, which is believed to be a most powerful safety and protection talisman for vehicles, like motor cars, auto rickshaws, vans, trucks and even scooters and motorcycles. This Suraksha Yantra is said to protect and secure the vehicle from accidents while travelling. The simple procedure of energizing and using the Yantra to protect vehicles is described below in this post. Normally this Vahan Durghatna Nashak [ Calamity Destruction] Yantra is prepared on Tamba [Copper]. However, it can also be prepared on a white piece of paper or Bhojpatra using red ink if one is using paper, Ashtagandha, or Raktchandana if one is using Bhojpatra. The Yantra should be prepared on a Tuesday and worshipped with offering of flowers and the lighting of an Agarbatti and Oil Lamp before the Yantra, Then the Hanuman Mantra given below should be chanted 11 times. The Paper or Bhojpatra Yantra should be laminated before keeping it in the vehicle. The Yantra should be installed on the car dashboard where normally Statues of Gods are installed , The Yantra should be kept clean and free from dust and dirt . The Yantra is also suitable for people carrying on the vehicle transport or taxi service business, where they have to employ drivers. Thanks for this post, since some of the root words within the yantra are not clear, request you to give them word by word line by line to enable us to get the right root word. The root words are specific to the position they are inserted in. 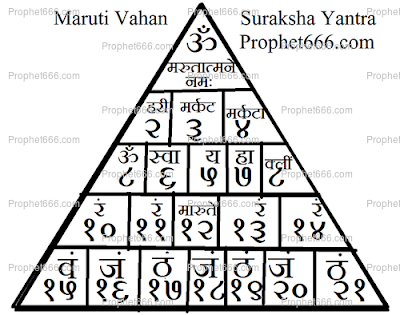 I think they show clearly in the Yantra image.